Photos from my Nepal, April/May 2016 trek with Val (aka Val Pitkethly’s On and Off the Beaten Track through Solukhumbu) are finally on Flickr. Overnight flight LHR to Delhi, with Jet Airways and onward flight to Kathmandu to rendezvous with Charles and Val back at the (seemingly unscathed) Hotel Marshyangdi. Dinner at Thakali Bhanchha – a local Thali / Mo Mo place – then back to repack for the trip! Jeeps from Kathmandu (काठमांडौ) to Dhap (2932m) via Harkapur (हर्कपुर) and Okhaldhunga (ओखलढुङ्गा) (1561m). Walk to Sigane (2660m), where we camped on the edge of the new dirt road, a couple of branches (twigs really) to ward off any passing tractors…..
Sigane (2660m) – Jhapre (2820m) – Bhulbhule (3365m). Rhododendrons galore, and a birthday cake. Bhulbhule (3365m) – PK Dairy (3640m) – Pikey Peak II & Pilates Planks (4065m) – Jase Bhanjyang (3550m). Wonderful blue skies and multiple mountain views as we headed north towards PK Dairy and then up PK / Pikey Peak, where Steffi set the pace with Pilates planks before the descent to Jase Bhanjyang, which would later be bathed in beautiful evening light as the sun set. PK Dairy and Jase Bhanjyang both provided opportunities to gather information about local families who might need one of Light Education Development (LED)‘s solar lights, and to do some distribution and repairs. But the mountain views won the day. 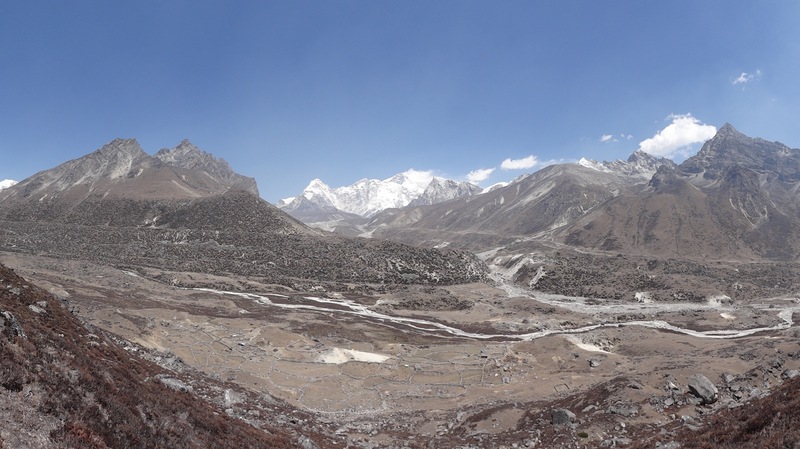 From our first stop, just outside Bhulbhule, looking east we could see: Shishapangma – Dorje Lhakpa – Chang – Ramdung – Bigphera Go Shar – Numbur – Khatang – Karyolung – Everest – Lhotse – Nuptse – Baruntse – Pethangtse – Thamserku – Kangtega – Drangnag Ri [?] (Peak 49) – Makalu – Chamlang – Mera – Naulekh – Kanchenjunga. Thanks, as always, to Günter Seyfferth for the marvellous annotated photos and maps (plus a wealth of other details) on Die Berge des Himalaya. 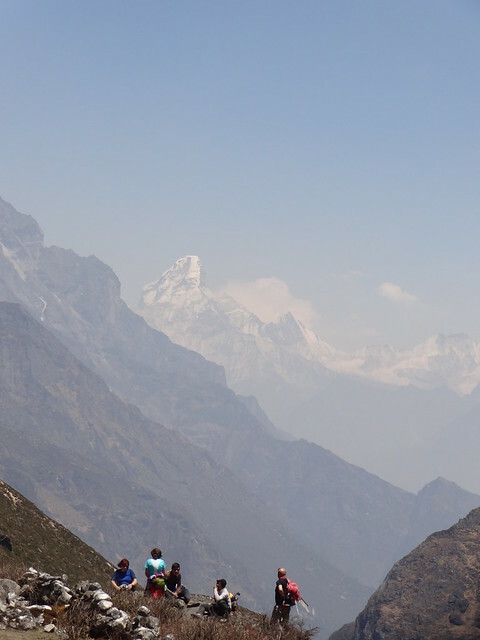 I’m using materials on Rolwaling Himal mit westlichem Khumbu. Another day of fabulous views of the Himalaya. The morning dawned clear and crisp, and saying farewell to our Jase Bhanjyang hosts we headed uphill, following the path past chortens with magical views north east (as far as Manaslu) and north west, emerging at an upland meadow in the shadow of Pikekhop high above the Lamjura La and the valley of the Taktor Khola. Small planes passing by, almost below us, on the Lukla-KTM shuttle run. Numbur and Karyolang straight ahead. After a photo stop we headed downhill descending through forests to reach the main path down from the Lamjura La and on to Junbesi. Beautiful rhododendrons in bloom. Hazel and I had been there last in 2011 on our warm up walk in week for the Three High Passes to Everest. 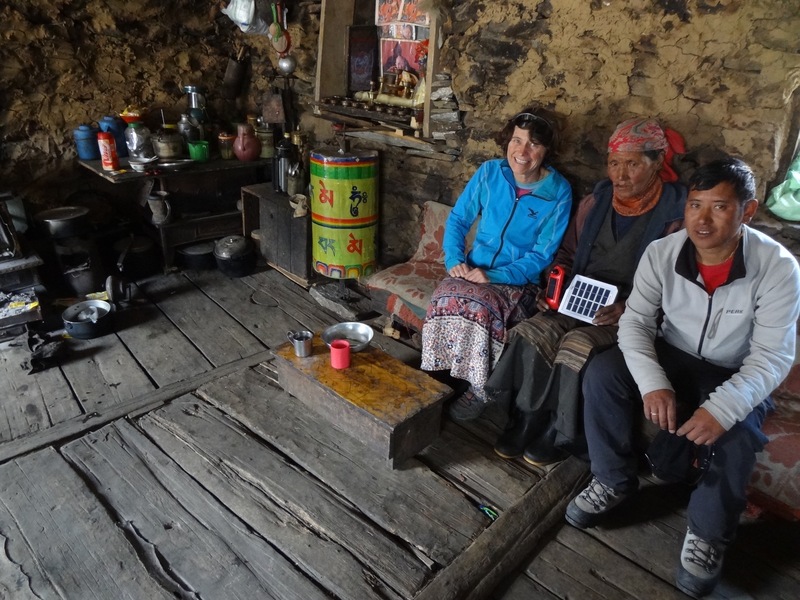 Val and Chhiring handed out one of LED’s solar lights to a cow herder we met en route; a short while later we passed his wife at their polytunnel home. Leaving the forest behind us, we reached small farmsteads in a picturesque alpine setting where an old lady materialised in search of a solar light and some medicine – Val providing both. In return, a thank you song and dance. Lovely. Downhill, past flag iris, to Taktor and the familiar small settlements leading to Junbesi. Getting hotter as the day wore on and we lost height. We stopped for a cuppa with a lovely lady Val remembered – it was fascinating being in someone’s kitchen and living room. Turning the corner into the Besi valley we were treated to clear views of Junbesi and beyond, and clear signs of earthquake damage – although many of the lodges had been or were being rebuilt, the stupa and school were both in ruins. We had a great view of Junbesi’s school hostel that four of Val’s Canadian friends had helped reconstruct in January. Settling into the lovely Apple Garden Lodge – a return visit for me – we lunched and then headed out with Val to visit the hostel. Back at the Apple Garden, we sorted out our tents – actually next to the apple garden – then adjourned to the lounge, where we met Steffi’s “Russians”, who turned out to be Ukrainians Lubko and Mykola from Lviv, and backpacker Jack who turned out to live down the road from Charles….. which resulted in a late night – 8.30pm! An early start to a hot and humid day’s walking, back on the Beaten Track – with birds (and birdsong) for company from dawn until dusk. A lot of down; a lot of up; a lot of down again. Leaving Junbesi, we had a gradual climb and contour through forests to the Everest View stop (and a cup of tea) at Phurtang, then a steady descent down to the bridge across the Dudh Kund Khola. Painful to lose all that height…. only to have to climb back up on the other side to Ringmo. We coincided with – and dodged – donkey trains for the rest of the day. A leisurely lunch, with TV and cute kids for company, then another 300m slog up to the Trakshindo La and into the cloud that had covered the (Everest) views all day. A speedy-ish descent past the Gompa and the lodge where I’d stayed in 2011, and on to Nuntala – the muddy path counterbalanced by rocks and stones, relentlessly hard on the knees and treacherous underfoot. We reached the Shangri La Lodge just as it started to rain. Jack already in residence. Tea and biscuits. A wash. Diary, reading, chat in the dining room. Dinner at 6.30pm: soup & pop corn, potato & veg, an orange. Bed at 8.15pm – the garden lawn making a super comfy mattress. Another hot and sticky day of valley-side trekking and donkey train dodging. Dropping down from Nuntala we crossed the Dudh Kosi at Chhirdi, then started up, up, up – to banana-growing metropolis Juving / Jubing for rehydrating tea, then Chyokha for cat snaps and on to Kharikhola where we popped into the Pema Namding Monastery on the western edge of the straggly village and were treated to cool orange squash from the cheeky, cheerful young monks. Lunch in Kharikhola at the Namaste Lodge – next door to the Solukhumbu Lodge where Hazel and I had stayed in 2011 – with its cheerful sunshade umbrellas and with a great view down the main street – perfect for people watching – and with Jack already in situ. Veg noodle soup, with home made chilli sauce, followed by salty chips, with more chilli sauce was fast becoming our regular lunch of choice. After an hour or so’s rest, it was off again – through Kharikhola Bazaar and then the final slog up to Bupsa. We arrived, hot and sweaty, at the Hotel Yellow Top around 2.30pm, and had a chilled afternoon taking the opportunity to wash hair, self and clothes. Tents pitched in the garden below. Lubko and Mykola materialised, kisses all round. Tea and Ukrainian chocolate in the dining room; sunset photos of and at Bupsa’s small gompa – where our porters were hanging out, updating Facebook. Dinner (veg noodles, local finger bananas) was preceded by dice (10,000) and a group photo – with Steffi and Chhiring demonstrating excellent “side planking” pilates skills. Struggled to stay awake until 8pm. To bed under a big, red, moon. An evening of music, dogs barking, nocturnal loo trips checking for killer caterpillars, and busy busy dreams – having a lot on this trip. Bed tea at 5.30am for a 6.30am start to beat the heat, and the donkeys, following the route taken by the early Everest expeditions. Pretty easy going – some ups, some downs. A cup of tea at the Kare La and our final view of the Khari Khola valley and the route back to the Trakshindo La. Hugging the hillsides we walked through shady forest to Poyan / Paiyan, stopping off at the Apple Pie Lodge for a cup of tea with an old didi Val knew well and where we lingered too long and were overtaken by the morning’s donkey trains. Onwards, over the Chutok La and down to lunch-with-a-view (and daffodils) at Pakhepani, then down to Surke. And then back up to Chheplung. Lots of steps and refurbished mani walls and prayer wheels – and evidence of the destruction caused by the 2015 earthquakes. Popcorn, veg fried rice, apple fritters. Bed at 8pm – lots of rain overnight. Bedrooms (not tents) at Chheplung Guest House! Steffi, Charles and I slept through the night’s two tremors. Our first full day on the main trail that runs between Lukla and Namche – and a familiar route for us all. In Phakding we had a few stops to for updates on LED’s solar light distribution done by one of the local ladies and then walked up to the Pema Choling Gompa for lunch, and to see the rebuilding. The old monastery Hazel and I had visited in 2011 was completely destroyed by the earthquakes last April and May. The ani gompa / nunnery 500m higher up was gone too – no fund to rebuild there, and one of the elderly nuns was helping out with the rebuilding work at Pema Choling Gompa. Val gave her one of LED’s solar lights, and Steffi donated her spare rain jacket. Fabulous mountain views (“better than last time!” was becoming something of a refrain for Steffi and I) and a lovely alternate route down to Toktok and along the west side of the Dudh Khola, with gompa dogs for company all the way to Bengkar. Amazing views of Thamserku at the head of the valley. We reached Monjo at 1.45pm, pulling into the Monjo Guest House Eco-Lodge – and another room! Well for the ladies at least – Charles was a gent and took the tent; a large group of Americans had booked up the other rooms. Solar showers all round – another treat. Dal bhat for dinner – Charles and Steffi got some longed-for chicken – with amazing apple pie for afters. Dice then bed in room 14…. Very windy and noticeably cooler than the past few nights. NICE! A half day. But with the killer uphill from the banks of the Dudh Kosi (दुधकोशी नदी) to Namche. A short stroll from Monjo to the Sagarmatha National Park entrance at Jorsale, and the low road along the river side to avoid the donkey trains (technically mule trains…). Our arrival at the twin high bridges coincided with a dzopkio train, and congestion on the bridge causing jelly legs for yours truly and an altercation between guides/groups coming the other way and dzopkio drivers. A slow and dusty ascent trailing behind the dzopkios until Chhiring took us off the main path and onto a forest footpath running just a few metres above it. Smashing. Rooms sorted (top floor, v nice), it was off to the Everest Bakery cafe for coffee and cake – elevenses! – and hugs from Lubko and Mykola as they passed by en route to Thame. Veg, Egg, Potato (with chilli sauce, of course) for lunch back at the Kongde View, then an afternoon shopping spree with Val at her preferred places: the (misnamed) Namche Wool Shop for trekking trousers (on a return visit after the dzopkio delivery) and a fleece hat, a place by Hermann’s Bakery for waterproofs. Purchases dropped off at the hotel, Chhiring led us up to the Everest Viewpoint. A bit windy and hazy, we sheltered with a hot lemon juice in the grounds of the Sherpa Museum before descending back into town… and heading into Hermann Helmars’ Bakery for wifi and beautiful late afternoon sunlit views of Thamserku, the Kusum Kanguru ridge [?] and the lodges on “our” side of Namche. Tea and biscuits (as if we’d not had enough refreshment today) back at the hotel, washing water in our rooms, a chance to sort out kit bags. Dinner at 7pm: veg, cheese spring rolls and chips (a winner). Bed at 8pm. Straight to sleep. Vivid dreams and (more) bites. A leisurely start to a half day’s walking, and porridge followed by egg toast sandwiches set us up for a bit of up to get to Thamo, a bit of down to cross the Bhote Koshi (भोटे कोशी), and a bit of up again to bring us (back) to Thame (थामे). En route rhododendrons and miniature irises galore, egg-carrying nuns, great views of Kongde Ridge, Kangtega, Thamserku and Kusum Kanguru. Lovely to be seeing everything in the sun, and to be staying back at the (rebuilt) Valley View Lodge. After a relaxed, al fresco lunch of veg spring rolls and chips it was time to say farewell to Dibir and Banu, two of our porters – heading home to take their school leaving certificate exams – and then to stroll up to the gompa at 3970m. Windy on the ridge, and lots of rubble in the courtyard. Slow descent, plenty of photo opportunities featuring ridge-line chortens, mani walls and prayer flags, the Thame and Thame Teng valleys and the marvellous mountains. Back at base tea and washing water, chats, chocolate and dice with Lubko and Jack, watching Krishna make a chocolate sponge cake, and keeping a watchful eye on Tsering the terrible two year old toddler…. and waiting for Mykola to return. A lammergeier cruised overhead on the late afternoon thermals and the sun set turned the mountains pastel shades of pink and blue. After a sumptuous dal bhat dinner we retired to our tents at 8pm, to sleep under a star spangled sky. An unforgettable day, acclimatising to the altitude with a day hike up to Thengpo for lunch and returning via Pasang Nuru’s in Thame Teng. After fond farewells to Lubko, Mykola and Jack who were heading up to Lungden/Arye with a view to crossing the Renjo La tomorrow, it was back up onto the gompa ridge for us and along the sandy juniper-lined path towards the summer yak pastures and stone homes at Khurkekharka. Gob smacking views back towards Thamserku and Kangtega, but no one in residence – with heavy snowfall last October/November and next to no rainfall since, there’s no grazing for the animals. Unbelievably the views got even better as we went further up the Thame Khola valley towards Thengpo: Ama Dablam – Makalu (मकालु) – Ombigaichan – Mingbo La – Malanphulan – Kangtega. Avalanches rolled down the slopes of the Lumding Himal on our left, the crystal clear river winding its way from one side of the wide open valley to the other. Yaks munching on what they can find. At Thengpo we tucked into our packed lunch of spicy noodle soup, cheese and chapati, drinking in the stunning views of Bigphera Go Shar and Pacchermo further up the valley. Chhiring checked the didi’s LED solar lights – still fearful of tremors she sleeps in a German Red Cross tent in the shadows of Tengkangboche and Paniyo Tippa. Three more avalanches, lots of photos – and paracetamol – then back down the valley, veering off into Thame Teng to visit Pasang Nuru, the Tibetan refugee painter who lost all of his fingers and toes in an avalanche many years ago. Tea, boiled potatoes and painting perusal and purchasing, then back to a busy lodge – Kiwis (4), Japanese (4), Brits (2) and Ladies (3). Washing water, diary, tea and biscuits, dice and my first win this trip! A cloudy day for the walk into the Upper Bhote Koshi valley, feeling feeble with an upset stomach. Our kit for this next stretch “off the beaten path” loaded onto yaks, we set off for Thame Teng and continued straight on to Tarnga, arriving two hours later and stopping for tea at the Yeti Valley Guest House. 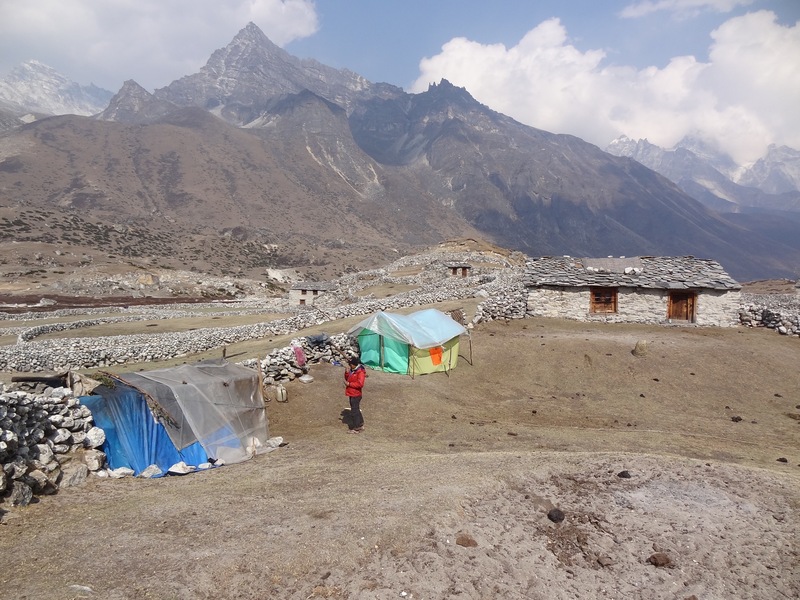 Then on for another two hours and a leisurely lunch at Maralung’s River View Lodge before reaching our final destination – Arya Guest House – mid afternoon, to find our tents already pitched in one of Pema Sherpa’s fields. Definitely off the beaten track, Arya perches above the Bhote Koshi river which carves deep into the ancient glacial moraine, a cluster of 3 or 4 stone houses and stonewalled fields. Somewhere en route we’d left the main path which goes to Lungden and the Renjo La, and seen a Himalayan Griffon Vulture and a Lammergeier taking slow, stately swoops along the river valley. Steffi, Charles and I were sent “up the hill” for a spot of acclimatisation. Not another trekker in sight, and clear views up the valley towards mountains, glaciers and the border with Tibet. 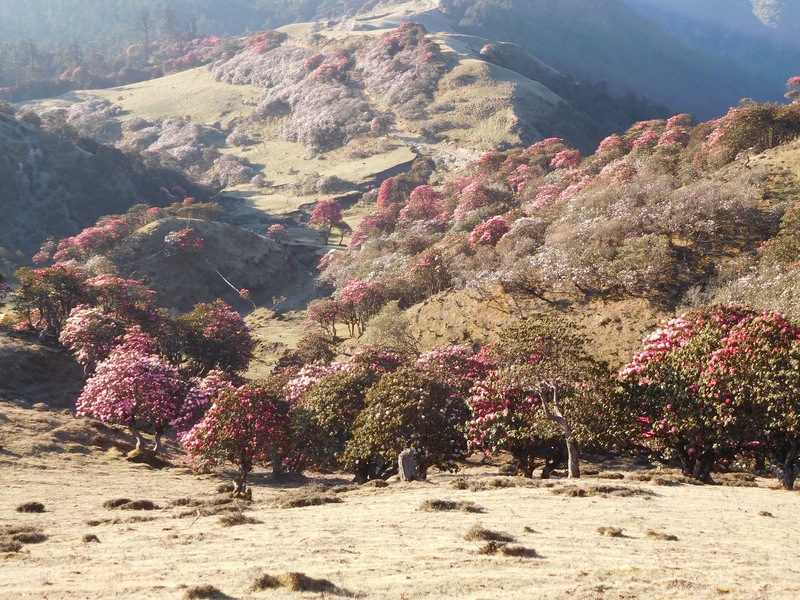 Barren and bouldered, not a blade of grass to be seen – the hillsides bare other than for patches of crispy, brown, small plant and the occasional burst of colour from the Himalayan Primulas and a magenta flower. Dinner in Pema’s lodge with a lovely toasty stove, rounded off with 2 Cipro to sort out my stomach. An epic day, with a “roll up your trousers” river crossing (only achieved with huge help from Gori, Chhiring and Krishna and Mosum) to another yak kharka campsite and an acclimatisation walk up to a ridge at 4787m with magical views – we could see Cho Oyu (8153m) which marks the border with Tibet – all before lunch! An afternoon of LED work, checking the solar lights left with two of the local ladies six years ago. Both lights are still working, and taken great care of. A couple more big bird sightings, and a wonderful sunset after the evening gloaming enriched the colours of the stone walls of homes and fields, with the snow capped mountains and glaciers arrayed on three sides of our camp. Another day feeling feeble – even with the amazing views we got from climbing high up on the other side of the river (crossed this time by a bridge) it was a hard slog, completely lacking the energy that had made yesterday’s ridge climb such a joy. We didn’t quite make it to the rocks-with-a-view that Val was aiming for, and the route down to our camp led us over loose scree and rocks – step light and swift. Late lunch then an afternoon indoors, snoozing and then playing ten thousand in Charles’ tent before an early dinner and bed. Feeling the cold of the glaciers as the clouds rolled in. A cold night, despite the cloud cover, and the river was frozen in parts. We started our return route, headed ultimately for Lukla-KTM-LHR, but begun with a gradual descent down the eastern side of the Bhote Koshi river. We paused for lunch amidst stone walled fields opposite Arya, sheltering from the wind in a yak corral. A young woman came to collect one of LED’s solar lights. Continuing on to Gomo, Val introduced us to an elderly couple who live there and we were treated to cups of chai, perched on bags of potatoes – their main crop and food. Then it was up….. eventually reaching another yak kharka, set high in the foothills of the Langmoche Ri, where a light scattering of snow dusted our tents at dusk. Another day filled with epic views from high on the hillsides above the Langmuche and Bhote Koshi valleys. Leaving the tents to dry out, we started with a stroll further up the banks of the river, to a view of the mountains and glaciers of the Langmuche Ri – Tengi Ragi Tau ridge (I think). My photos don’t do them justice. Small birds and purple flowers on the way back, and a stop at the yak herder’s farm to check his LED solar light and to have a cup of tea. A harsh place to live, but beautiful today under clear blue skies. Leaving the yak kharka we descended along the eastern hand side of the river, traversing to come out high above the Bhote Koshi valley. More amazing views, and a stop to leave our thanks and prayer scarves at a cairn, and to take a last lingering look at Cho Oyu (चोयु, ཇོ་བོ་དབུ་ཡ). Then on some more, crossing the plateau and keeping our height (more or less) to come out high above the Langmuche Khola. What A View: the valley far below, snow topped ridges and 6000m peaks on the other side. Then sharply down, the steepest, sandiest section of trail of the trip. Slip-free, fortunately, all the way down the the bridge where the Langmuche Khola flows into the Bhote Koshi. Cloud had gathered on our descent and the rest of the day’s walk back towards Thame was overcast. In Thame Teng we paid a return visit to Pasang Nuru, watching him work on his paintings while we tucked into lunch. Then back to Thame, and the lovely Valley View Lodge. Val did us proud – en suite rooms in the new block!!! I’d picked up a cold somehow, and it kicked in today leaving me out of breath even on the flat. Slow going. No photos. We retraced our route from Thame back to Thamo, and then up to Khunde. I fell way behind everyone else (bar Val) on the steps up through the forest to the village of Khunde. We did see a dhanphe though – beautiful. The stuff coming up from my lungs, not so much. We were lodging with more Sherpa friends of Val’s, and after lunch I went to bed to try and sleep off my cold a bit. It worked. Val, Steffi and Charles went to visit Dr Kami Temba and the hospital. A leisurely early evening in the kitchen, with a visit from another of Val-didi’s old Sherpa didis. Dinner then bed. Clear skies for the inevitable trips to the outdoor loo. No more al frescos…. I woke up feeling much better. Phew. We headed up to the hospital for breakfast with Dr Kami Temba – one of the magical things about doing a trek with Val is that you get to meet people who live and work in the places you pass through. It’s not just about the great outdoors. Our next visit was to the Sherpa-didi’s lodge to meet her son and to see his paintings. Her walls were adorned with photos of some of the early Everest expeditions. Then back to our lodge to pick up bags and to head down to Namche, crossing the Syangboche airstrip en route. It makes Lukla’s look like LHR. Down down down, meeting people on acclimatisation walks coming up up up. We got the fantastic view of Namche in its hillside bowl, lodges and hotels in curved terraces facing Kongde Ri ridge on the far side of the Bhote Koshi valley. We had time for a return trip to Hermann’s German Bakery (and its wifi) for a coffee before lunch at the Kongde View, then it was back down the dusty path heading for Monjo. At the Monju Guest House Eco-Lodge we all got rooms …. all en suites and this time they came with solar showers. A delight. Over tea and biscuits we chatted with the two elderly American ladies who fostered abandoned pet rabbits doing their trip of a lifetime. An inspiration. Grey skies overhead, and increasingly humid as we dropped down to Ghat for tea with a view and on to Choplung / Chheplung (2660m) for lunch back at the Chheplung Guest House …. I am pretty sure we were all thinking about our flight tomorrow. Shortly after we turned onto the path up to Lukla it started to rain. Not much. But enough to let you know that those clouds were full. Val led us through Lukla’s main drag and to the far side of the airport to the Lukla Numbur Hotel, handily located for flights and similarly handily connected to the main agent for Tara Air. Repacking to meet the 10kg weight limit was a challenge without any idea of how heavy our bags were in the first place, so Steffi and I were ruthless on what we decided to leave behind. Val disputed the loo roll decision in vain. A lovely, lovely evening though – farewell celebrations with our fantastic team: Chhiring, Krishna, Gori, Mosum and Dancing King Nataraj. Early morning rise and shine to be met with lingering low cloud. Deja vu waiting at the airport as other would be flyers arrived. Very grateful to be in Val’s expert hands – that took some of the stress away. But… that cloud turned into rain and later hail with thunder and lightning, so no flights at all that day. I loathe Lukla. Next time I’m walking out as well as in. Eventually. On the last flight to leave. Very relieved to touch down in KTM after circling over the outskirts for what felt like forever. Lunch back at the Thakali Bhanchha, then shopping and/or showering before drinks in the courtyard of the Hotel Marshyangdi followed by dinner with Maila just down the road at the Mandap, courtesy of Kang Kora Treks & Travels. It’s all over so suddenly. Heading home, we were treated to my first ever WOW view of the Himalaya from the flight to Delhi. Stunning. We almost lost Charles in Delhi airport but managed a swift farewell before he headed off to catch his flight, Steffi and I following courtesy of Jet Airways soon after. Mission accomplished: photos fully Flickred and notes published just in time to depart on the next trip – we’re off to Autumn in Ladakh. Established by the inspiring Val Pitkethly, Light Education Development is a charity supporting remote communities in Nepal and Peru. I’m a trustee. LED’s mission is to provide low-tech solutions to 3 basic needs: affordable and sustainable solar lighting, basic education and essential healthcare. To support LED you can donate via our JustGiving page, volunteer or trek with Val. Read more on our How You Can Help page. I spent three weeks in April/May on another great trek with Val Pitkethly, and in the company of two familiar faces from last spring’s Tsum Valley Trek – sirdar Chhiring and cook Krishna. But instead of tackling the Manaslu Circuit as planned, Steffi, Charles and I spent three weeks with Val and our trek crew trekking off and on the beaten track in the Everest area, ending up in one of the remote valleys below the Renjo La that lead to the glacier-passes to Tibet. On the beaten track you could easily forget about the earthquake (and then you’d find a house/stupa in ruins). Off it, people are still sleeping out under tarps and tents, too scared to sleep in their houses. Val and Chhirring did solar light distribution and checking/repairs/replacement all the way, and we were often invited into homes and tarp-tents to be thanked with tea by ladies living solitary lives tending their family’s yaks in their summer pastures way up high in the region’s remote valleys. A hard life for humans and animals – ongoing drought meant that vegetation was sparse, and what there was had dried to a crisp. Some of the other main memories: Stunning rhododendrons; Steffi and Chhiring Pilates Planking; Jack, Nikolai and Lubko (how could we forget you? ); potatoes…. ; a Krishna-Cake for my birthday in Bhulbhule; that bird call; dice games galore; coffee, cake and wifi in Namche; actually seeing Namche, and the Kongde Ri; exciting river crossings; three sick days; “last night” dancing party in Lukla, loads of amazing views…. and al fresco loos. So how come we switched from Manaslu to Solukhumbu? I caught up with Val just before she headed out to Nepal a couple of days ahead of us. Our plan to do the Manaslu Circuit was off – there had been some big landslides in the previous couple of weeks which made some sections of the trail difficult underfoot, even for the people who live there, plus Val was worried that there could be more landslides. So we were on Plan B: Solukhumbu. Val knew Steffi, Charles and I had all been to the area before – Steffi and I met her (and each other) on the Three High Passes to Everest trek in 2011 – and so Val had planned out an alternative route which would have some familiar names but the places in between would be new to us, and off the beaten track as far as possible. All being well, we’d get stunning views and the opportunity to deliver / check / repair / replace some of simple solar lights that Val’s charity – Light Education Development (LED) – provides to some of the region’s most remote communities. From the road head at Dhap we trekked to Junbesi via PK / Pikey Peak (aka Off the Beaten Track, part 1), then took the main trail to Namche, north west into the Thame Valley and up the Bhote Kosi towards Lungden (On the Beaten Track, part 1) before heading off the (relatively) popular route to explore the remote valleys beyond Arye (Off the Beaten Track, part 2). Our return route back down to Thame took us high, high above the Bhote Kosi valley, and we headed back to Namche via Khunde and breakfast with Dr Kami Temba at Kunde Hospital (Not sure if that classifies as On or Off the Beaten Track!). The final section – Namche to Lukla – was always going to be On the Beaten Track (part 2) – and The Big Question for Steffi and I was whether we’d actually get to fly fixed wing back to Kathmandu…. which we did….. just…. but only after almost two days of increasingly agonised waiting featuring a day of low cloud and hail, a premature farewell party with our crew and lots of time in the dining room of the Lukla Numbur Hotel. Next time I’m insisting we plan on walking back out right from the get go. Our time in Nepal over, we were treated to wonderful Himalayan views out of the window of our Jet Airways flight to Delhi, although we did almost lose Charles in the international transfer “process”.